A bold, sophisticated classic. This striking rectangular pedestal sink from the Boulevard Suite brings a touch of uptown flair to any bathroom. Its ergonomic Right Height<sup></sup> design helps prevent back strain. Made from high-gloss, stain-resistant Vitreous China. Archer offers a timeless appeal, blending subtle elements of Craftsman woodworking techniques and the intricate facets of jewellery. Distinguished by its beveled edges and clean geometry, the Archer sink creates a universal look that suits an array of bathroom styles. Pair this basin with the Archer pedestal for a brilliant overall effect. A perfect blend of traditional and contemporary design, the Elmbrook pedestal sink basin complements a full range of bathroom styles. Beveled edges and simple lines enhance the uniquely shaped basin. Generous deck space on the back of the basin provides space for toiletries. Pair this basin with the Elmbrook pedestal for a complete pedestal sink. Boulevard 4-inch Bathroom Sink Pedestal Basin A bold, sophisticated classic. This striking rectangular pedestal sink from the Boulevard Suite brings a touch of uptown flair to any bathroom. Its ergonomic Right Height<sup></sup> design helps prevent back strain. Made from high-gloss, stain-resistant Vitreous China. 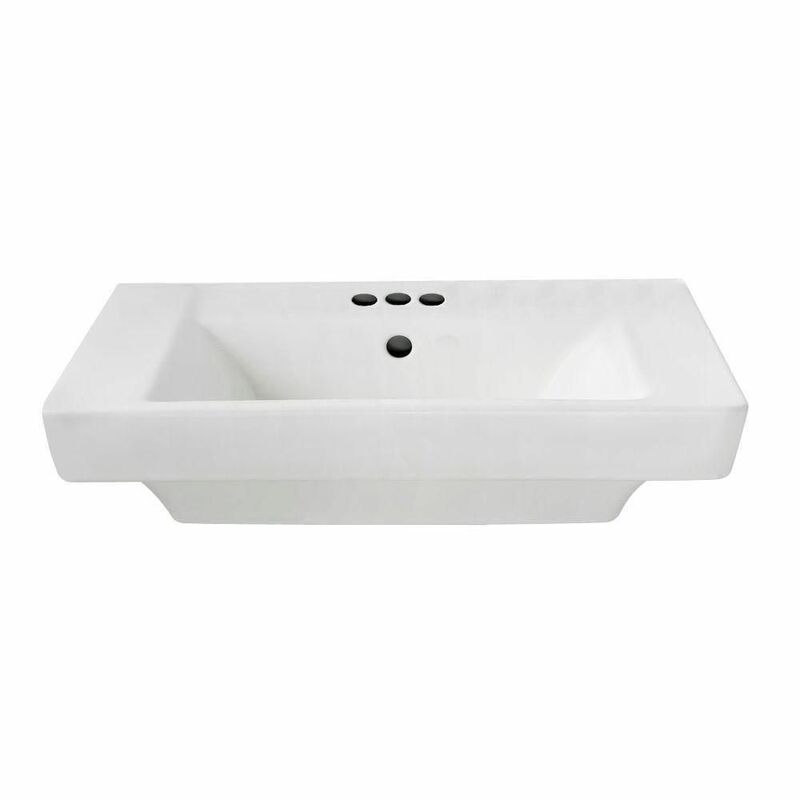 Boulevard 4-inch Bathroom Sink Pedestal Basin is rated 4.8 out of 5 by 5. Rated 5 out of 5 by HomeDepotCustomer from Great.... Great. Rated 5 out of 5 by Peanut from Attractive bathroom sink We bought this sink for an existing cutout, replacing an outdated, old sink. The cutout (approx. 20" wide x 18.5 deep) was larger than the sink required, but still fit ok, just a little lower than it normally would. Also, it didn't completely cover the back against the wall, but I was able to caulk it to keep water away - and no one can see it anyway. It was really difficult if not impossible to find a sink that exactly fits our existing cutout....obviously, we couldn't.. (The 18.5" from front to back should be less for optimal results) It took a little longer than it might have, due to the existing cutout, but wasn't too hard. We made sure that it sat securely before using brackets to hold it in place. Mind you, the warranty requires using the provided cutout pattern, but we are experienced enough to use the existing cutout. Know what you are doing. It sits on the counter and adds a nice touch to an older bathroom. Very nice quality sink, looks beautiful and does the job! We do admit that we wish the existing cutout would have been what is recommended for the sink, but I would buy this sink again even knowing what we know now. Rated 5 out of 5 by retrodiva from Perfect size The sink was just the size I was looking for. My bathroom is small and this sink fits nicely. Rated 5 out of 5 by Bruno from Satisfied with quality and price. Fast delivery. Looks good, although the surface could be smoother. We're using as a vanity-top sink (no pedestal). Good fit to the vanity, after some cutting of the back of the vanity to accommodate the rear (wall-mount) parts of the sink. The old familiar American Standard logo is not embedded in the surface, but instead attached on the side as a little sticker (a bit cheesy). It was interesting to note that this "American Standard" sink was produced in China. Time will tell about performance. Rated 4 out of 5 by Designer from Gorgeous Sink I work in the design center for a home builder. This is by far the most popular above counter sink choice for my clients. Beautiful, modern lines and extremely functional. Clients really like that they have options to install it higher or lower (most select lower). Only 2 drawbacks are that the overflow is visible and the back of the sink is open, preventing installation for a full counter-to-ceiling mirror behind it. I am sorry but it is not. The template itself will be in the box with the sink. There is no required faucet for this sink, it would be your preference. I am replacing a Ellisse Countertop Lavatory installed in my bathroom. The lavatory is 24&quot; wide x 20&quot;. Can I install a Boulevard 0641.008 24&quot; wide x 19&quot; without changing the vanity counter? How big is the overflow hole, we want to put some kind of cover or beauty ring. The overflow hole is 1&quot;. I am looking for a metal piece to cover the over flow to give it a little nicer finished look. Do you guys offer anything like that or do I need to look for that somewhere else? The overflow is not meant to be covered. We do not manufacture anything like that. I will only buy made-in-America products. This sink has an American flag on the page when I look at it, but does not show up in the &quot;Made in USA&quot; search. IS it made in the USA? This sink is made in Canada. Can I use this sink for Cardiff Vessel stand? The Cardiff stand is manufactured for a vessel sink. Your countertop should provide suffient support for the lavatory. anchor bolts are not neccesry for this method.